Since I’m old, I took not one, but two naps to get ready to stay up till midnight to order my Apple Watch. Steve and I both wanted one and even though he THOUGHT I would stay up late and order his for him, he was wrong about that. He’s never stood in an excessively long line, stayed up till midnight or stayed home all day sadly peering out the front window waiting for the UPS delivery truck. I thought it was time that he experience the joy for himself. Brett Canedy tweeted to me asking if we should all hang out in the NosillaCast Live chat room to share the experience which sounded like a grand idea to us. If you haven’t ever joined the live show before, it’s actually really easy to join the chat. You can do it with a dedicated client which is a very nice experience, but to dip your toe in the water, you can simply go to podfeet.com/live and there’s a chat client embedded in the web page. This makes it much easier for folks to just give it a try. We’ve done the chat room thing for a few events lately and it’s really a fun way to enjoy the experience. We did it during the latest Apple event all the way from India. So I tweeted out that the chat room was open (it’s always open by the way), and Brett, Tim Gregoire (who was only there because he didn’t want to study), Barry Fulk, Pat Dengler, and David Roth joined Steve and me. Based on previous experiences, we decided to use the Apple Store App to make our purchases. During the dreadful experience of buying the iPhone 6s for me and the kids, the trick was to use the app to get through while their web servers fell over. We were able to get in quickly and I placed my order for a 38mm sliver aluminium sport watch with a white band in probably the first 2 minutes the store was open. When Steve pushed buy on the 42mm space grey aluminium sport watch with a black band, it asked him for the 3 digit code for his credit card. Clearly Steve does NOT buy as much stuff from Apple as he should! It took us a couple of minutes to dig out the card and find the code, and that couple of minutes was enough to cause his ship date to slip out from April 24th to May 13th. I was sad for him but luckily he didn’t seem too devastated, just a little bit sad. We did find out why this happened. 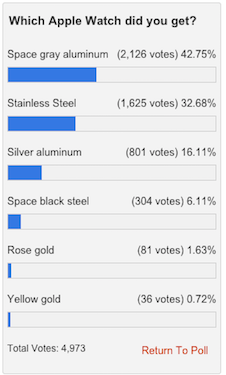 iMore and a couple other sites did an informal poll asking people which watch they ordered. As of the time I wrote this, nearly 43% of the 4973 respondents who bought an Apple Watch have ordered the space gray aluminium. So I guess it’s a popular model? I suspect that Apple will see this huge tilt towards one model and step up production so maybe those watches will ship faster than we thought. I sure hope so for Steve’s sake! 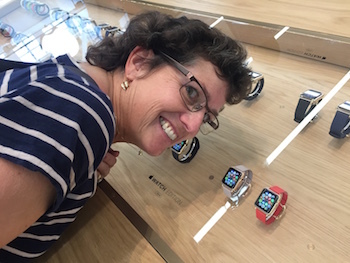 It was anti-climactic that by about 12:10 we were done ordering our watches, so Steve suggested that we have some fun and try to schedule an appointment for the first day to try on the Apple Watch. I thought this was nutty to even try but like I said we were disappointed that the buying experience was so seamless, so why not? We tried to use the Apple Store app on iOS but it took us to the Apple website, so we flipped over to our laptops. And there we were rewarded with Apple’s servers falling over in a heap (as Bart would say). I was able to get to the point where I could select our Apple Store, the day, and the time but when I tapped on Make Reservation I got an error web page. I did this over and over again and finally tweeted out my frustration, at which point Kevin K (AKA @CNJBrownBear) suggested I check my email. Sure enough, I had THREE appointments! It turned out the only failure they had was in delivering the message of success! This also explained why each time I went to make the reservation, the count of available appointments decremented by one! I cancelled one of the appointments but decided to keep two for 1:30pm. I did that so both Steve and I could try on the watches. I have had the experience where I have a genius bar appointment and I try to ask a question on a second device and they tell me that I have to make a second appointment, so I wanted to hedge my bets on the Apple Watch try on experience. However, just before we left, Steve suggested I check to see if both appointments were still there, but alas they had cancelled one of them. It turned out not to matter a bit. We went into the Apple Store a bit before our appointment time and were immediately taken care of by Zach, who said of course we could both try the watches on, but he’d only be allowed to show us two at a time. I was amazed and a bit disappointed to see that the store was NOT a zoo. I might even say that traffic in the store was a bit on the light side. The store had a gorgeous glass cabinet with all of the watches displayed including the gold Edition watch. Zach lead us away from there to a table where he waved his point of sale terminal device at the edge, and a drawer slid silently open revealing an array of watches. I know this is silly but I think it might have been the coolest thing about trying on the watch! Zach took out the silver aluminum sport watch in 38mm for me, and the space grey aluminum sport 42mm for Steve. The good news is that the 38mm fits my wrist exactly as the 42mm fits his, and they both fit perfectly. We knew we’d made the right size decision. The black fluoroelastomer band felt fantastic to Steve, very soft and flexible and fit him like a glove. I have to say though that while the white fluoroelastomer was a beautiful texture that I really liked, it’s stiffness around the connection to the watch made it kind of bulge out away leaving a gap between the band and my wrist. I tightened it up and it fixed it, but I don’t like to wear my watch all that tight. I’m hoping that the band softens with the warmth of the wrist and maybe becomes a bit more flexible. We also wanted to look at the Milanese loop watchband. This will run you an extra $150 and since it’s my birthday I threw one of those in my shopping cart when I bought my watch. I felt that the Milanese fit me much better than the fluoroelastomer band. It’s so slinky that it just melds to your wrist and the magnet makes it fit to exactly the size of your wrist. I was surprised that it wasn’t as shiny as I’d expected. It’s a bit more industrial looking than I’d hoped because it’s darker but it still felt great and looked really nice. I’m guessing I’ll wear the white band for exercise and the Milanese for dress up day. Oh one more thing, Zach was quick to point out that the Milanese loop will not pull your arm hairs out, so that’s a real nice feature. The Milanese was on the stainless steel watch (remember we ordered aluminium) and it was noticeably heavier. I was glad that I preferred the lighter aluminium especially because it’s much less expensive! I wanted to see how hard it was to swap bands, so Zach went back to the aluminum with white fluoroelastomer band. He said the Milanese is a bit harder to remove, I suspect because it doesn’t come all the way apart into two halves, or at least not easily. Zach pressed a button on the back of the watch and then slid the band out of the slot. Now I know everyone’s been getting excited about third-party bands, but there may be a bit of a snag here. We noticed that the band and the watch had pins for the connection. Zach said it was for both a magnetic connection and a mechanical connection. I’m not saying there won’t be third-party watch bands, but I suspect they won’t be in the $10 category if they require the precision of what we saw. I realized after we left that I didn’t spend hardly any time really looking at the WATCH. The ones we were allowed to try on were running a demo so we didn’t pay attention to them until Steve felt the haptic feedback go off. He said that it felt like the sensation went through his wrist rather than just touching the surface. I can’t vouch for this because it didn’t happen to go off while I was wearing one. He said it wasn’t unpleasant, just unusual. We did a Periscope of the whole Apple Watch try on experience, so if you want to watch the drawer open and see the pins inside the watch and the band, you might want to take a look at the video we posted on podfeet.com. It’s also in our Google Plus community over at podfeet.com/googleplus. After we got done trying on the watches, Zach told us we could play with one that was on the same table (in a stand). You couldn’t do too much with it but we were able to zoom in and out of the main screen of bubbles with the crown, select by pushing in, and pretty much stumble around guessing what the other button did. I would not call it a good test of the product by any means but it’s fun to say we got to play with it! After that, Brian, who has helped me a bunch of times at the store suggested we go play with the new 12″ MacBook. I’ve been trying to get Steve interested in replacing his 2011 MacBook Air with one but he says it’s not the machine for him. While it’s only 2 pounds instead of the fatty 3 pounds of the 13″ MacBook Air, the processor in it is really low powered and that would be a problem when he’s on the road. While his 27″ iMac at home is the video work horse, he does download and edit a smidge of video when we’re on vacation and his existing machine really stumbles on it. There were a flurry of articles about how the new Retina 12″ MacBook is as slow as a 2011 MacBook Air, but I have my doubts about that. First of all, the articles came out on April 1st. No one pulled them down, but they go to a dead link on the PrimateLabs.Geekbench.com site. I was able to find some results that seemed to support the claims but I stand suspicious! In any case, Steve and I wanted to play with the new MacBook and clearly Brian wanted to also. We tested out the new Force Touch trackpad first. If you haven’t heard about this, it’s a trackpad that has no mechanical click but through unicorn tears and magic fairy dust they have created the illusion that it does have a mechanical click. If you press on the trackpad it clicks, press harder and it clicks again and brings up contextual menus. Brian shut the Mac down and waited a few seconds and sure enough, when we pressed there was no click at all. The trackpad DID move slightly down when we pressed on it, but no click like when it was powered up. I’m not sure how useful this is, I’m a tapper not a clicker anyway, but one fewer mechanical thing to break is a good thing. Except of course now it’s an electrical thing that will fail when you spill liquid into your laptop. I was a little bit worried about the new keyboard. During the announcement they droned on for about 3.5 hours about the new trackpad and how the distance of the keys was less, and since I really like the current keyboards I was dubious. I found it felt pretty good though, might take some getting used to but really just fine. Not magical, just fine. Then came the fun part. I asked Brian if they had the 13″ Macbook Air in stock with a 2.2GHz i7, 500GB SSD and 8GB of RAM. I knew they didn’t because it’s listed as build to order on the website but he said they did, so I said, “just throw one of those in a bag for Steve, will you?” Well it IS his birthday too, you know! Congratulations and Happy Birthday, Steve. That’s a great computer and with the new Intel HD Graphics and Superfast (probably Samsung) 4 channel PCIe SSD, should blast off! I am, as you know an “Apple Guy”. Multiple (4) Macs in the house, three iPads, countless iPods lying around, Apple TV. The exception being my phone. For several reasons, I’ve always preferred Samsung/Android to iPhones. That’s neither here nor there. Because my phone is Android, I was allowed to jump into the wearables arena a lot sooner than iPhone users are doing just now. I bought a Moto 360 with the leather band….paying the “early adopter” price of $249. Its now $179, presumably because of a new model being on the way. That’s how tech rolls, right? My take: Smart watches are pretty much the same. They do the same things, more or less. Giving you the time, notifications from your phone, etc. But what I really view them to be are toys and remote controls for your cell phone. There are none that seem to have “killer” features that differentiate one from the rest…..at least, to me. After having one, I’ll say “its cool” and “fun to play with”, but……I’m getting bored already. In fact, I was in the Caribbean two weeks ago and bought a new Movado watch because I’m tired of my smartwatch….or at least….wearing it when “dressed up” or at a business meeting, or something like that. I still like it, but “the bloom is off the rose” and the novelty is clearly wearing off. So, whats that got to do with the Apple watch? 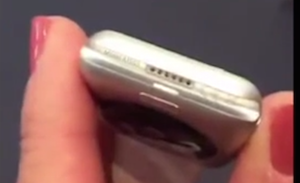 Well, I’ve seen it, and its very much like all the others (except it works with the iPhone). Oh yeah, one other difference. To get one tricked out with a decent looking band, you’re looking at close to double what I paid for the Moto 360 equally equipped. SIDE MATTER: I really don’t understand the urge anyone might have to buy the gold edition. These things are TECHNOLOGY — by its nature, designed to be obsolete in MONTHS, not years. They’re not classically beautiful heirlooms in the making. They’ll go in the same drawer as two year old iPod since its appears you won’t be able to scoop out the “innards” and replace with “this year’s model”. So, Apple Watch early adopters are likely to have as much fun as I did when I bought my Moto 360. But they’re paying twice as much to sit down at the table and join the game. My advice, likely to go unheeded….is wait. More watches will come out, compatible with Apple device. I hear 3rd party watches are on the way. At the very least, that will bring price pressure upon the Apple Watch. But since people will NOT take my advice, have fun with your new toys! Thanks George. My experience with the new MBA so far is just that – it screams.